Gittleman reviews the latest scientific research and provides a proactive plan to counteract the toxic effects of overexposure. 84 percent of Americans own a cell phone, 89 million of us watch TV beamed to us by satellite, and we can’t have a cup of coffee our local café without being exposed to Wi-Fi. Wireless internet, smart phones, and laptops have transformed the way we work and live. But what are the consequences of this revolution? The same technology that allows us to video chat with friends across the world and surf the Internet from the comfort of our beds has exposed us to a dangerous and unprecedented number of electromagnetic fields (EMFs). We are constantly being exposed to EMFs—invisible lines of force that surround all electrical devices—at a rate 100 million times greater than our grandparents were. In her groundbreaking new book ZAPPED (HarperOne, Hardcover $25.99, on-sale October 2010), health expert and New York Times bestselling author Ann Louise Gittleman reveals startling truths about the invisible hazards of the 21st century that will motivate us to change how we use our laptops, how we locate our home electronics and televisions, and even how we sleep. Hold your cell phone away from your head when the call is connecting—that’s when the signal is strongest. Keep televisions out of the bedroom. They emit AC magnetic fields that interfere with the production of melatonin, the hormone that governs your Circadian rhythms. Eat to beat EMFs. Superfoods and seasonings such as artichokes and cinnamon help to replace the anti-oxidants, enzymes, and nutrients that electro pollution can rob from your body. Gittleman’s expertise in nutrition allows her to formulate a diet that turns your body into a shield against EMFs and other electronic dangers. Are we going to give up our cell phones, laptops, and other electronics? Absolutely not, but emerging scientific evidence tells us that it is crucial to make important changes in our home and work environments. 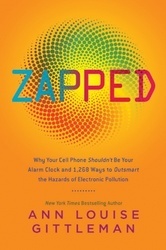 A must-read for anyone who is plugged in, ZAPPED teaches readers how to survive the dangers of technology and thrive in the wireless age. For more information, visit the official site at http://www.areyouzapped.com. New York Times bestselling author Ann Louise Gittleman is highly respected as a health pioneer, weight-loss expert, and award-winning author of thirty books, including The Fat Flush Plan. Ann Louise's credentials include an M.S. in Nutrition Education from Columbia University and a CNS from the American College of Nutrition, and her work has been featured in Time, Newsweek, The New York Times, CNN, The Wall Street Journal, USA Today, The San Francisco Chronicle, and many other outlets. Gitlteman has been recognized as one of the top ten nutritionists in the country by Self magazine and has received the American Medical Writers Association award for excellence. Visit her website at http://www.areyouzapped.com.